Stretch Hummer Limo H2, a Large Party on Wheels. The Hummer stretch limousine will accommodate up to 20 passengers . There is typically a fiber-optic lights, flat screen TVS', a wet bar and luxury seating in these Hummer stretch limos. There is more headroom, legroom and extra storage space for things like purses or hats and coats. The driver is also further away and there is usually a privacy enclosure so there is no need to worry about the chauffer listening in on what is going on in the back. With a wedding, the entire wedding party, the bridesmaids and the groomsmen can all ride together to the church and the reception hall. Having a Hummer stretch limo also comes in handy when the wedding party is large and everyone needs to get to a photo shoot such as the park or other special place. No need to worry about anyone getting lost or delayed when everyone is in the same vehicle. With a Hummer H2 stretch limo, people don't have to worry about the essentials such as insurance, gas and directions. All of this is taken care of by the limo company. When a couple or group of friends pool their money for a nice limo ride to and from a special event, they want to make sure they get there on time and with no distractions like stopping for gas or directions. All limo drivers will know exactly where they are going ahead of time and will have gassed up the vehicle in advance as well. The trip will be smooth and without incident both to the venue and on the return to the starting point. A Hummer limo would make a great place to take a bachelor or bachelorette to their destinations or on a pub crawl because no one would have to sit out on the drinking. The designated driver would be the chauffer and everyone could join in the drinking fun. These limousines come in traditional classic black and elegant white hummer limousine for whatever celebration or special event people want to arrive in style for. They are made by a company in California , the Krystal Koach Company who make some of the best stretch Hummers for limousine industry. 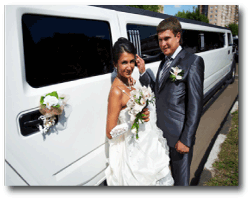 Younger people who want to pool their money together and rent a limousine for a special event, such as a prom or formal dance, will find that they can get more people in a Hummer limo than a regular stretch limo. Not only will this save impress their friends, dates and everyone the come across, it will save each of them more money than renting a regular limo.